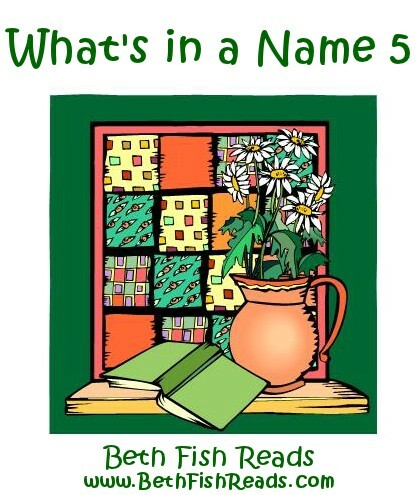 Welcome to the fifth What's in a Name challenge This challenge was originated by a young blogger named Annie, who hosted it for two years. When she decided to give up on being the host, I took over the challenge. I credit this challenge with being one of the prime reasons for my becoming a blogger, so I am thrilled to be its new host. To join in, sign up with Mr. Linky below. If you aren't a blogger, just add a comment. If Mr. Linky ever disappears, either try again later or click on Email Icon in the side bar and send me your information, and I'll add the link myself. To use Mr. Linky: put your name or your blog's name in the top box and the URL (web address) of your blog in the bottom box. If you don't have a blog, use your tumblr account, your Facebook page or simply mention your intent to join the challenge in the comments. Thanks to @DogEaredCopy, @marny_h96, @Zetablue, and @SuziQoregon for suggestions for, inspiration for, and confirmation of this year's categories. Feel free to suggest ideas for 2013 in the comments. I hope you like the categories! Have fun and good luck. You came up with some really good categories - I'm in! Already thinking about what I could put in my categories. Thanks. Congrats on this .. it sounds fun. I'll think about the commitment I dont want to say I'm in unless I can do the whole thing right ..
Now I have already made up my mind not to fail ... eh participate in any challenges next year, but those categories are great. I just love so much that you've kept this challenge going. :) Thank you! Great categories - I don't know how you manage to come up with such creative ones every year! Little Bee is on my nightstand pile so I will hold onto it till January! Categories look great! I'm in. Really great categories, and my mind is already racing, thankfully my shelves are full of some that will fit in. You know those ever growing shelves..LOL. Looking forward to seeing other's reads too. Sounds great! I'll be back when I've done my post so I can link up. Always enjoy this challenge. Your categories for this year are such fun: yay! This will probably be the only challenge I sign up for in 2012, because I bombed them this year. I need to read one more for the What's in a Name 4! Thanks for doing this. As someone else said, I already have at least one book that will fit most of the categories on my TBR list. I am always tempted to join this one because it is just so darned clever. I've been anti-challenge here the last year or so, but I'm going to think about it. Though I don't join many challenges, this one sounds like a lot of fun. I am going to have to consider it! How fun to see the new categories for WIAN(5)! SUCH fun categories!!! I never actually complete everything in this challenge, but I'm still always tempted to sign up! I'm spending way too much time today looking for books I already have that fit categories and then searching the library for others. Will be back to link up when I do my sign up post. I'm joining for sure. It's always a challenging challenge for me to find just the right books. Thanks for sponsoring it again. Love the categories this year!! Excellent categories! This Challenge is the reason I started blogging -- of course both Ellie and I are in for next year! Thanks so much for hosting. oh my..I love the categories for this one next year. So creative but doable and fun. I'm going to have to keep my challenges to one or two or three next year and this one is a strong contender! I'm in! Had a great time last year and can't resist the new categories (not to mention, I'm a challenge glutton). A favourite challenge and love the categories for 2012. This is so creative, I can't resist! Terrific! Thanks for hosting again :) I'm in. I have just signed up and posted my list of books. Can't wait for the challenge to begin! I'm really excited to take part in this challenge! Thanks to christina_reads and birdgirl_1107 for advertising it on their Livejournal accounts! This challenge tipped me into blogging too. I'm resisting signing up for many things but I can't resist this. So I'm going to have a lovely time rifling through books to put together a list. Haven't selected my 2012 books yet or finished 2011 -- but hopefully I will get it done! I had so much doing the challenge for 2011! Thanks for hosting again!! By the way, I have an "oops" in my sign-up. I'm #44 - Darlene @ Darlene's Book Nook. I wasn't careful enough and let Mr. Linky pre-fill the fields and the last book I linked up is showing up in brackets behind my blog name. Can you delete the "(Defining Diana)"? Fun categories! If I break down and decide to try challenges again, this will definitely be the one! Sounds like a fun challenge and doable as well! I am in.. I wouldn't have thought of these categories - so creative! I'm already looking forward to coming up with my list of books. I love this challenge! I have done it for the past two years and it's so fun trying to find titles to fit the categories. I'm definitely in again! I'm finished with all of my books for 2011. Now just to get all the reviews up and link them up. Love the categories - it will be like a scavenger hunt thru my To-Be-Read list of books. I've notified members of BookTrib where to get info and sign up. I'm looking forward to participating again. I really like the categories!See ya in Jan.
Glad this one is going again. Love the challenge of finding a book to fit the categories. I've posted about this at Just Books. Have a great day! Love the new categories! I'm in! Thanks for hosting this challenge :) I'm really excited to participate this year. Great categories! 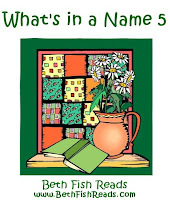 I have posted my What's in a Name 5 book list in Goodreads. Looking forward to 2012! I've signed up. This is going to be good! In for another year. This time categories are great... but also difficult! I only have one for now, it'll take some time to work them out! Great! Yay! This is the first reading challenge I've ever signed up for, hopefully it doesn't start an addiction! I'm ready for a reading challenge and this one looks very fun. Can't wait till January! Thanks for hosting it again. I'll have a go but need to refine my list! This is only my second time for this challenge, so I'm definitely in! I'm making myself use books I already have, so I may have to get fairly creative to fit one of the categories. This challenge was also one of my first experiences with book blogging. I'm glad to find it again! I was inspired to start a blog. I don't know how often I'll post but it is started. Not that excited about creepy-crawly category but I'll grin and bear it. Sign me up! This sounds like a fun challenge. I'll add my link as soon as I get my blog up & running. Can't wait to get started. I read so much anyway I'm sure I'll be able to meet those categories! I am a first timer. So excited to participate in your challenge. Really looking forward to this. Thanks for hosting! This is my first time I can't wait! <3 reading. I am thinking a Austen/regency theme for my categories. I love these kinds of challenges--the scavenger hunt for books is sometimes the most fun part! First time I'm participating in this challenge. It's innovative and promises to be fun! This is my first time but I am excited!!! I wasn't successful two years ago, but I'm going to give it another go. I'm excited to get started! I am excited! Blogged about this today; got my first title. I will be reading it the first week in January. Fun! Sounds like fun. I'm in! Thanks. I'm new to reading challenges. I found this one from my friend Rachel at Chaos is a Friend of Mine. I can't wait to dig into the challenge of picking books then reading. Thanks for hosting such a fun challenge!!! I always enjoy this challenge, and you've got some great categories for 2012. I'm off to peruse my shelves for appropriate titles. This was fun last year. I'm signing up for this years challenge too. Looks like fun. I'm going to combine this one with a couple of other challenges. I didn't quite complete What's In a Name this year, but I had fun trying! So, I'm in again for 2012. Looking foward to the challenge! First time joining this challenge. Looking forward to it! I've done this challenge in the past and loved it. I took last year off, but I'm back to doing challenges in 2012! Thanks for hosting. Just signed up! Thanks for hosting! I am so excited to join this one for the first time this year!! Thanks for hosting! So excited! I really enjoyed this years. Love the categories for 2012! This challenge sounds like fun! I'm tweaking mine - all will be mystery books! This looks really fun! I'm in! We signed up to this last year--but in January both children became very ill (they, unfortunately, even made it on to Real Rescues!) which put our year off to a bad start, so we've decided to re-try for the new year. My two children: Hazel & Kieran will be joining as well! Is it cheating the book I'm reading fits a category already? Signed up!! it would be fun to read the categories i have never bothered to read before!! Great idea and I look forward to playing around with some titles. I'm in. Loved last years categories so I'm anxious to find books to fit into this years. Thanks Beth. I started this challenge last year & petered out, so I'm back for another try. The categories sound fun. Thanks for hosting! I am so excited to see other's choices. Thank you for hosting! Brilliant challenge, I have lots of ideas for all the categories. Well done for hosting! On behalf of my two boys (9 &4)who love to read. They are taking on this challenge! This sounds like great fun, so count me in! Sounds fun! Already got one category bumped out! Thanks to Kinna Reads's "Can Chameleons Crawl? On 2012 Reading Challenges" for the heads up about your challenge. Excellent! Sounds like fun I am in! This is my first year signing up for reading challenges. I love your categories! This is going to be my challenge reading year. i usually pass on them but i'm going to make all the attempts to do them this year. My first ever reading challenge. Can't wait to play. Such fun. This sounds like a lot of fun. Thanks. What an interesting project. I love to read as much as I love to quilt. Can't wait to get started! Glad to join in..
Great challenge. Can't be too hard, right? Wow, some really challenging ones on here! But hopefully it well help me focus on what to read next! I studied English Literature at Uni many, many years ago and was a mad keen reader! However, years of children and their needs have made reading history. One of my resolutions for 2012 is to get back into it. Santa brought me an e-reader so it's portable and I can't lose my place. This sounds like a great way to explore reading again. Thanks for hosting. Discovered this thanks to Melody and it ties in well with my idea to do a weekly book review as I love reading so much. Thank you. I've never done this challenge before, but it looks fun! I'm looking forward to trying to figure out the books for each category! Thanks for hosting! Finally got my post up for this challenge! I love this one! Linked1 I m sure it is going to be fun! I'm in! I did this in 2012 and had fun. Sounds like fun and yet a challenge! this is the first reading challenge I have joined. I always enjoy this challenge! I'm looking forward to seeing what books I end up using. Finally! It took me a while to get my sign up post up, but it's done. I am quite excited. Fun and I recruiting like crazy. Wow! Sounds interesting. I'm in! Yay! I am so excited to join! This is really cool! Going to start figuring out my book titles right now! Thanks for doing this! Didn't manage to complete it last year so I'm having another try. I really like the categories and look forward to finding books in them. You must have so much fun picking the categories! Another late to the party, but looking forward to this challenge. It's fun to have new ways to look at the books in my TBR pile! this is the first time I have ever participated in such a challenge. I am recently retired and am envisioning lots of time to read. This is my first time in a challenge and I can't wait! I love reading with my toddler & preschooler. Thank you for including us. I'm going to give this one a shot. Thanks! I'm coming in a little late, but I have read (since January) one book that matches a category and I love the idea of this challenge. Thanks for hosting! I am excited to finally return to the land of reading for pleasure, after spending the first few months of 2012 reading for exam prep. Excited for this challenge and thank you for hosting! I'm excited to be doing this again, even though I've got a late start. Looking forward to what everyone will end up reading! I really enjoyed doing this last year, hopefully I can keep up with reviews this year! Hi! If I sign up for this challenge now (since it is better late than never!) could I include any of the titles I have already read in 2012? Thanks in advance! @Wuthering: yes, any book read in 2012 will do, even if you just signed up. I am super excited to give this one a try! Can't wait to go exploring at the library! I wasn't gonna do this challenge in 2012 but I have changed my mind. I just can't stay away from it. I did this challenge with Annie the first two years and had no idea that someone else was hosting it! Is it to late to join for this year? Hope not! I've just signed up, and am loving the categories. I may have to take advantage of the rule that says creativity is encouraged in terms of fitting in titles though! Thanks for hosting and putting so much thought into this. Joining again this year in order to try to regain my will to blog. This looks like fun. Too bad I didn't hear of this sooner. But I'll try to see what I can come up with in the time that's left. This looks fun. Too bad I didn't hear of it sooner. But I'll see what I can come up with in the time that's left. better late than never, I guess. just posted my first for topographical: Hiking Through (the Appalachian Trail)Hope I'm doing this right. Please let me know if I'm not. Thanks!